Hi Everyone, Welcome back to PinkLuxpl! I thought it would be a great idea to share with you the beauty products I have used up and how they worked. Sometimes when trying a new product it can be gold or end up coal. Surprisingly, all the products listed are gold in my book and will be repurchased. 1. The Bikini Zone shaving gel is AMAZING. This is my first time using this product and I love how it really prevents the bikini area from bumping up after shaving with a razor. It is a blue gel that is very soothing to the skin. Be careful when applying because it can slip off your fingers if you shave in the shower. With bikini season around the corner I recommend using this product instead of shaving cream or conditioner. Razor bumps are not cute and can be very annoying. 2. I am sure you ladies have heard of this amazing Argan oil of Morocco by Ogx if not you live under a rock. (Just kidding) I love to apply this to the ends of my hair when I am wearing it naturally curly. You can also apply to straight hair, just make sure to apply a small amount so it does not weigh the hair down. It leaves your hair so soft and shiny. 4. 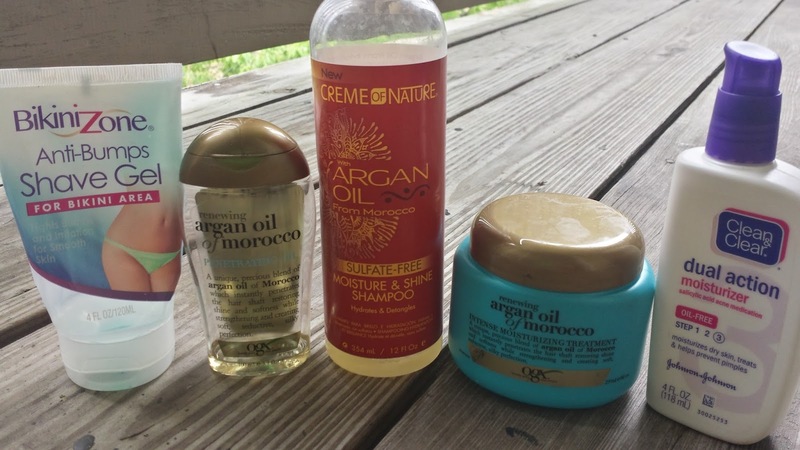 This product has been raved on the blog before and is used in my weekly hair routine. You can check out my hair routine here. 5. Lastly, the Clean & Clear dual action moisturizer is a product I have purchased over an over. I love how it makes my skin feel hydrated after applying. This is used as a first layer before priming the face for makeup. It also prevents breakouts which is always a bonus in a beauty product. Well ladies and gents those are all the products that are empty and need to be restocked. I am headed out tomorrow to restock and might find some new gold items.